Walk2Win The Fight Against Prostate Cancer (W2W) 5K is a community walk held during June in Washington, DC. June is National Men’s Health Month and the perfect time to rally community members to fight against prostate cancer. Organized by the Walk2Win Committee and community partners, the 5K event is a fun-filled morning enjoyed by participants of all ages and all fitness levels. Some leisurely walk the course, others run or jog, and everyone raises critically needed funds and awareness to fight prostate cancer. 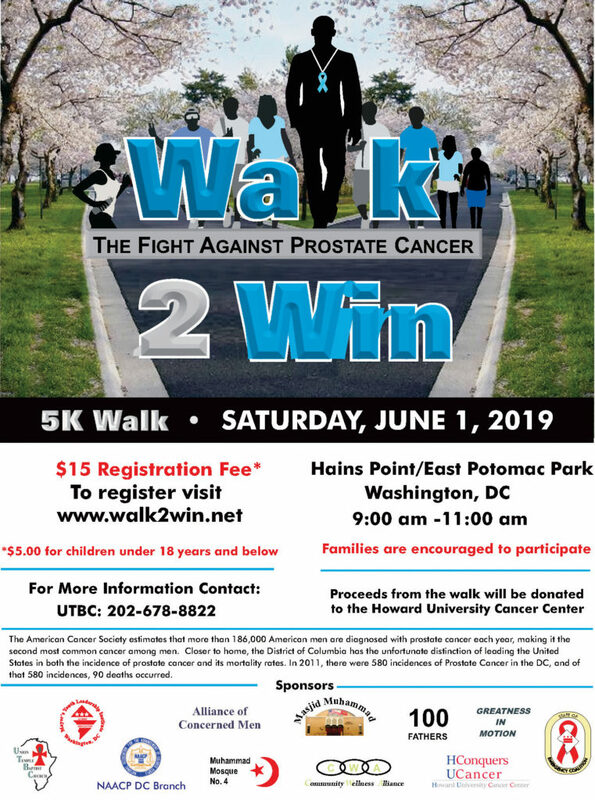 Proceeds from this year’s and the four previous Prostate Cancer Walks have benefited the Howard University Cancer Center (HUCC). HUCC provides cancer prevention and control services aimed at reducing the spread of cancer and improving the quality of life among minorities and underserved populations. 1 in 6 men will be diagnosed with prostate cancer in his lifetime, but through, education, treatment and support, prostate cancer is beatable. With awareness and prevention, we can stop prostate cancer before it claims lives. Why do we need to fight prostate cancer, especially in greater Washington, DC? The District of Columbia leads the United States in the number of men diagnosed with prostate cancer and number of deaths from prostate cancer. Copyright © 2018 Walk2Win Committee. Design by GE Design and Photography Studio. All Rights Reserved.